Home Dr M goes wild in japan Dr M goes wild about plant blindness in Japan! Dr M says: Never in the history of human kind has there been a more pressing need for plant scientists and plant science research. It is not an overstatement to say the future of the human species and the sustainability of our biosphere depends crucially on plants and on advances in plant science research. However, people, in the Western world at least, tend to be blind to plants. Plant blindness seems to be a real phenomenon, it is the tendency to ignore or just not to notice the plants in one’s own environment. Plant blindness can be exemplified by the fact that many young people, including secondary school kids and first year undergraduate students, tend to find plants boring and certainly uncool. This is especially true when compared to their running, skipping and jumping, wide-eyed, cute and cuddly counterparts the mammals! Plant blindness has implications in many walks of life including conservation, for example, plant conservation receives only a fraction of the funding that animal conservation gets and a recent paper in Conservation Biology blames this on Plant Blindness. So all in all it’s perhaps not so surprising that many (most?) school kids don’t think plants are cool, in fact give the prevailing tendency to ignore and undervalue the plants in our world, it’s perhaps amazing that any young people should think of studying plants and botany at all! 3. Cocoa beans used to make chocolate: This is about economic uses of plants – tea, coffee and chocolate all globally significant cash crops, for example the chocolate industry is worth nearly 100 billion each year! Cocoa is the source of chocolate and the scientific name of the Cocoa plant is a small tree called Theobroma cacao, literally meaning the food of the Gods tree. To make chocolate the beans are harvested and thrown on the floor in the pulp and covered with banana leaves. The unique bacteria in the environment there ferments the beans and changes their flavour. Making cocoa flavour unique from one location due to the unique bacterial combinations. After this the beans are sun or oven dried. Then transported for roasting. Cocoa is mostly farmed on small holdings and as a result has great economic significance as a crop in these largely developing countries. Fascinating cocoa fact: chocolate has over 400 distinct aromas (a rose has just fourteen) and over 300 chemicals including vitamins and minerals, even the smell of chocolate can induce relaxation and a cup of pure cocoa has double the amount of antioxidants as green tea. Chocolate contains phenylethylamine which is released naturally in the body when ardour is inflamed, it also contains dopamine – a natural painkiller – and serotonin which produces feelings of pleasure, no wonder chocolate was and still is considered the divine aphrodisiac! 11. Forests – this image reminds us that plants make up habitats for animals and the conservation of biodiversity depends on plants as the building blocks of habitats and ecosystems. The vegetation of global biomes such as forests, grasslands, tundra etc are all crucial carbon sinks and play a pivotal role in global climate regulation and are a key tool the fight against human-induced climate change. Forests are filled with many beautiful and important species of plants and animals and are iconic habitats for the global conservation movement. Forests also have a special place in the human psyche and we should not underestimate their significance for our well-being. Fascinating forest fact: The Japanese have a word for it, two words in fact Shinrin-Yoku – forest bathing. Scientific research has shown that walking in the forest can have many measurable health benefits including lower blood pressure, reduced stress, improved concentration, reduced depression and hostility, increased vitality, better concentration and increased creativity. 12. Sunflowers by Vincent van Gough: This is about the importance of plants in art and culture and aesthetics. Plants have been the stimulus for a vast amount of art, literature, poetry and music. Plants are often used as symbols in art, mythology, religion, literature and film, plants play important roles, symbolising fertility, growth, purity and rebirth. In architecture and the decorative arts plants provide many themes, such as Islamic arabesques and the acanthus forms carved on to classical Corinthian columns. Fascinating art fact: Much music has been inspired by flowers, and roses are probably a number one inspiration, no doubt due to their heavenly scent – though roses offer only fourteen distinct smells which is modest compared with over 400 for chocolate! Dr M says: This short journey around twelve of the many ways in which plants matter to us represents the tip of the botanical iceberg! Plants are fascinating, beautiful and totally invaluable, the importance of plants in our lives and in the future of our planet cannot be overstated! 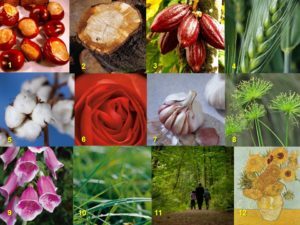 Plant blindness is the inability to see or notice the plants in one’s own environment, even though they are all around us and much more present than most animals! We ignore plants at our peril! Dr M talks Japanese: By way of thanks to colleagues in Japan for this second invitation (he first visited way back in 1991!) 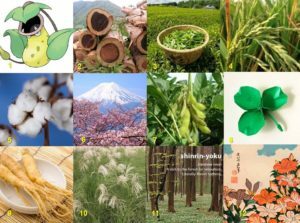 here is Dr M’s take on twelve things plants do for us Japanese style! See if you can identify them all and tell their stories! Have a nice day, and if you do have a nice day, for sure you will have some plants to thank for that! Thoroughly entertaining reading Dr M! I’m not a child but a very keen gardener and will be passing this page on for others to enjoy! Eat more chocolate I say!